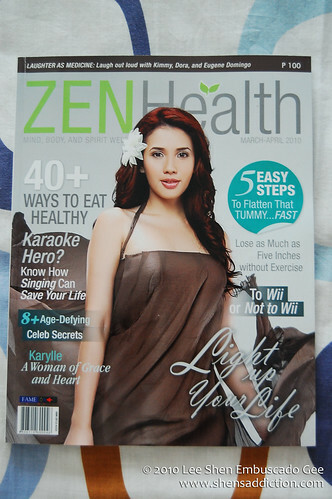 When I met Chuchie Ledesma of ZenHealth Magazine in an event, I secretly hoped that I still had the same job as hers. She was nice and cool to talk to that I wanted to exchange information with her. I was surprised when she contacted me for a write-up... Then, she contacted me to offer a column!! It has been my dream since I was a little to girl to write. The hunger for words started when I began reading Sweet Valley High books, then I moved to more mature reads like romance novels and philosophical books. I devoured magazines that my aunt sent me like it was food. Then I moved to reading Filipino magazines, from Women Today to Cosmopolitan to Lifestyle sections of the newspaper. When I was in high school, I joined my school newspaper to which I was assigned features and developmental communications. I even made my own magazine using a scrapbook one summer. But in college, I began to digress in writing and focused on a more pressing need which was to ready myself in law school. And to have your name printed in paper truly is an accomplishment a yearning writer wishes to achieve. 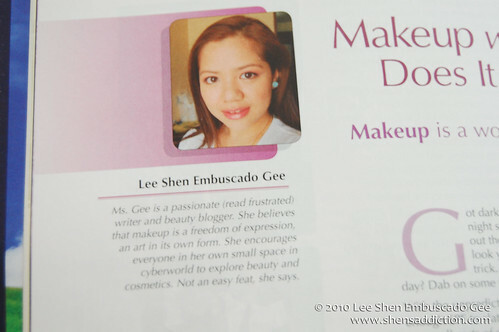 When I first saw my name printed in Sense and Style Magazine, I was ecstatic. But to have your own column, it is every blogger's dream.. at least it is for me. I have always imagined this day would come but I was never really sure. My very first article with ZenHealth: Makeup with SPF: Does it really Work? My column did not only come with my name printed on it but with a picture and a blurb about me. Yey! Thank you, ZenHealth and its wonderful people, for trusting my knowledge in beauty. I will endeavor to give you my best in every article you assign me. :) The same as I do in every post I make in this blog. Readers, please grab this copy of ZenHealth to read if Makeup with sunscreen protection really works and to lead you to a healthier lifestyle. 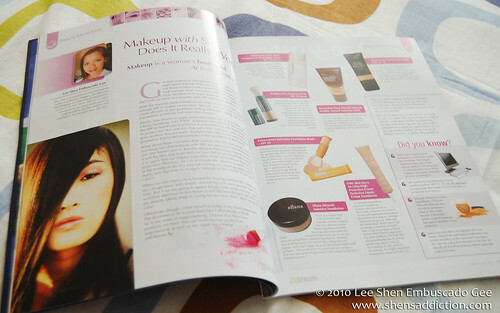 In the April-May issue, I will be discussing the perks of Mineral Makeup. Learn more about the healthy makeup and those that I recommend. 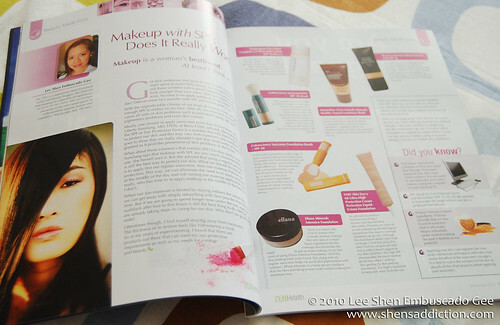 There will be more topics about mineral makeup there by the talented writers of ZenHealth. Wow congratulations Shen! I also want to grab a copy of this magazine. Congrats...! Hard to find yun zenhealth mag....Will keep looking.